Gift Ideas to Support Liberty Lane - Looking to make your gift giving special? Want to show someone less impressed with "things" that you are thinking about them and you want to make your gift to them something special that helps women and children in our community? 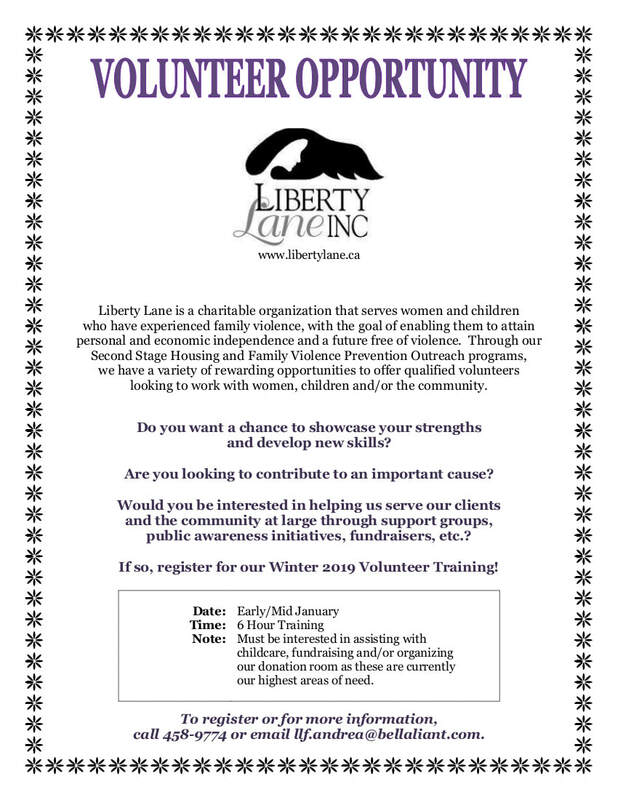 Consider giving the Gift of Liberty Lane - contribute to helping with a client's rent for a week for $100 or a counselling session for $25. These gifts go to support the programs and services provided by Liberty Lane. Make the purchase and then print off the flyer to include with a card to let the receiver know you care about them and women and children in our community trying to escape abuse. It's that time of year again! Our annual wine tasting fundraiser is happening on Wednesday, November 21, 2018. Join us at the King Street Ale House at 6:30pm for a tour through six different wines and bite size food pairings. We'll have our silent auction tables full of great items to treat yourself, or maybe start your Christmas shopping early? A fun night out with friends and you're helping Liberty Lane Inc. raise money for the programs we offer to women and their children leaving family violence. A song about Liberty Lane debuted last night at St. Anthony's Church in Fredericton. Written by Irene Jewett and Debbie Roy the song raises awareness about family violence. 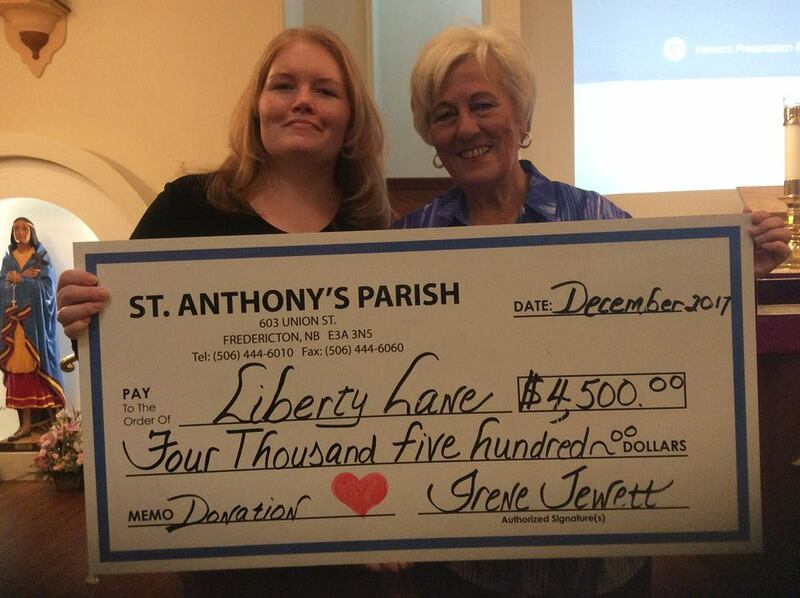 Irene has organized benefit concerts for the past four years to raise money for Liberty Lane. Debbie, Irene's friend and a local musician, wrote the song with Irene. ​Like everyone in Fredericton and across the province, the staff and volunteers at Liberty Lane are incredibly saddened by the four deaths that occurred on August 10th. These tragic deaths affect everyone in our city in some capacity. Liberty Lane has a connection to the family of Constable Sara Burns in that her husband, Steven, was one of the two key personalities in "Burns & Jones' Long Long Walk for Liberty Lane" earlier this summer. We at Liberty Lane consider ourselves extremely fortunate to have worked with Steven and our deepest condolences are with him and his family in this time of grief. The staff and volunteers at Liberty Lane extend our sympathies to all of the victims and their families. This June, Brian Jones and Steven Burns are leading the way down the Trans-Canada Highway from Edmundston to Fredericton in a plan to raise $100,000 for Liberty Lane! Stay tuned for details about being part of the walk, and donating to the event. Visit our Facebook page to see the launch video! There are many generous people in our community; and they've helped us raise $600,000 of our Capital Campaign goal, $900.000! How can we top last year? On May 8th, you'll hear about an amazing fundraising event to support Liberty Lane's campaign. You really won't believe what people will do to help women and children affected by family violence. ​Legal Aid is a service offered to those with low income in need of legal representation. Their services typically fall within criminal and family matters. However, in New Brunswick, many services are not covered by our legal aid system. For family matters, these services include, “variation of any order made under the Divorce Act (including child support); division of marital property; variation of spousal support (New Brunswick Legal Aid Commission, 2012).” This places many women who fall into the low income category who are experience domestic violence unable to file for divorce from a violent partner. If their partner files for divorce while attempting to gain custody of their child, the woman has no representation from legal aid. This often forces women to self represent against their violent partner, risking the custody of their child and a fair agreement of divorce. Covers some divorce (will not if it includes property etc).